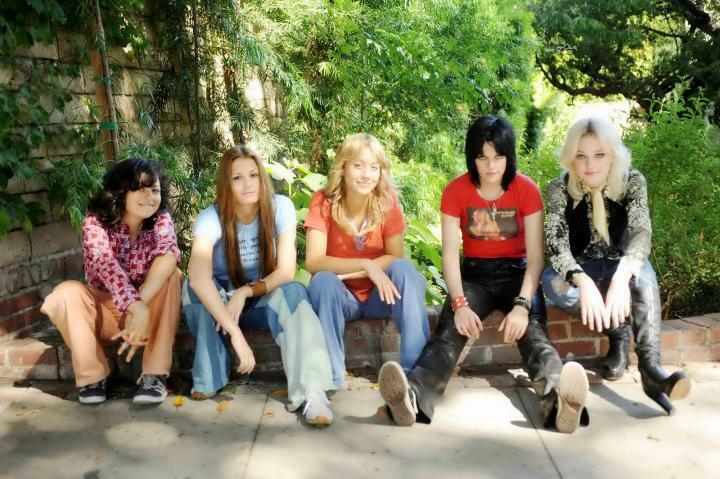 The Runaways is just one of those movies you can watch over and over and over again. Having already seen it in the theatre twice, I was still out at HMV buying my copy of The Runaways dvd on Tuesday. Even if you’ve watched the film a few times already, there are some amazing moments in The Runaways worth revisiting. When watching my Runaways dvd for the first time, so many cool things came back to me that I’d forgotten about from the movie theatre. There’s a lot of little moments in the movie that really make it as good as it is – be it transitions, a telling close up shot, or a brief moment of dialogue. I love that transition from Cherie (Dakota Fanning) making a wish in front of her birthday cake before pinching out the lone candle, to Rodney Bingenheimer‘s dark and sultry club with Gary Glitter’s “Do You Wanna Touch Me” blaring in the background. There’s the telling shot of Joan (Kristen Stewart) walking out of the guitar lesson with MC5’s “It’s A Man’s World” trailing her footsteps. Then there are moments on the road as The Runaways are touring where we see Cherie’s face through a rain-spattered car window passing in the night. Her face is impassive and flickering street lights illuminate her unchanging expression.We see shots of Joan throughout the film trying to keep a strong exterior for her band mates as they struggle with Kim Fowley, the dark side of life on the road, and the pressures of being overnight stars within the music industry. I love all of Joan’s scenes: the water gun, the headliner’s dressing room, “I Love Playing With Fire,” “Old Smoky,” the recording studio blow up, The Runaways song writing process and later on, her initial formative stages in creating Joan Jett and the Blackhearts. The story really comes together with all of the smaller details put together. The Runaways is definitely a film that pays attention to the little things to get the realism of the film just right. I found that while watching the dvd, the fantastic portrayals of Joan and Cherie by Kristen and Dakota came to life even more with every little nuance they perfected for their respective roles. There’s some great behind the scenes footage, particularly of a live set for the Japan concert in which a corset-clad Cherie performs “Cherry Bomb” for the screaming masses. There’s also a segment on the making of The Runaways with interview clips with Kristen Stewart, Dakota Fanning, Cherie Currie, Floria Sigismondi, and various other people involved in the film’s production. Cherie Currie and Joan Jett were on hand to help their movie star selves get into character and aided them in preparing for live performances of The Runaways songs. Kristen learned all of the songs she would be performing in the film even if the studio version of a song was going to be used for a certain scene. She wanted to look, feel, and play the part of Joan in every sense. Dakota likened her closeness with Kristen to the relationship between Joan and Cherie. She noted that her and Kristen had grown close through The Runaways experience just as Joan and Cherie had with the formation of the original band. In an interview clip on The Runaways dvd she says Kristen is her best friend. Dakota Fanning’s favourite Runaways song is “Cherry Bomb” as she got to experience first hand what it’s like to perform the song many times within the movie. Kristen Stewart’s favourite Runaways song is “Love Is Pain.” Kristen sings some lines from this song in the latter half of the movie while smoking a cigarette in a bathtub of murky water. Joan Jett was on set every day to coach Kristen in becoming her character. Kristen says that Joan is the coolest person she’s ever met. Various filmmakers from The Runaways attest to Kristen’s dedication to the project and her serious approach towards paying tribute to Joan and her music rather than simply playing the character. There’s also a Runaways audio commentary with Joan Jett, Kristen Stewart, and Dakota Fanning that I haven’t checked out yet but I’m sure will be well worth it. Just thought I would share some cool things on the dvd if you haven’t had a chance to check them out yet. So as we all know The Runaways is coming out on dvd tomorrow, and I am just doing a quick bit of research to find out where the best place to buy it might be. I live in Vancouver, BC so this post will be geared towards Canadian Runaways fans out there. HMV – $18.99 – Item #210337DV *Update* Online price says $18.99 but I just bought it in-store for $16.99 in Vancouver. Superstore – $21.00 + – I went into Superstore to check when shopping last week and with tax it was around $22.00. Not cheap there! They’re all around the same price but I know lots of people like to compare prices, so there you go! All formats seem to be Widescreen from what I could tell and all will have the same features no matter what store you buy from. However, those prices are only valid for a short time according to the Future Shop and Best Buy sites so purchase The Runaways dvd sooner rather than later. 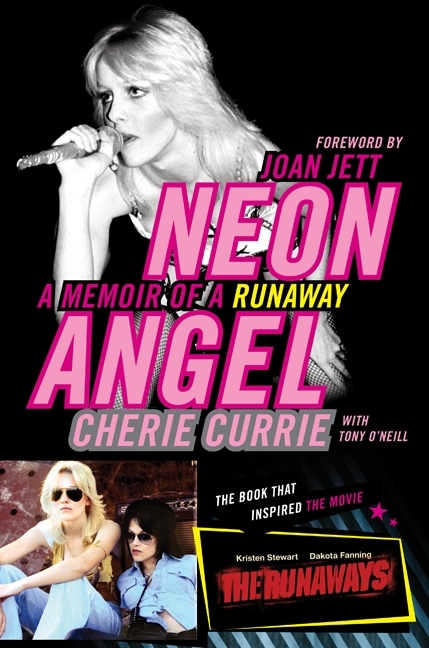 I recently finished reading Cherie Currie‘s book Neon Angel: A Memoir Of A Runaway, and it really struck me as something word reading, whether you’re a fan of Kristen Stewart, Dakota Fanning, or the original Runaways band members such as Joan Jett and Cherie Currie. This book is very raw, it tells it like it is, and it unabashedly sheds a lot of light on the life and times of Cherie and her Runaways band mates. What’s great about Neon Angel, is that it fills in some of the blanks from the recent Runaways movie. The movie doesn’t feel like it has holes, but once you read this book, so many more details and nuances are filled in and make the whole story richer. Reading Neon Angel was eye-opening. It instills a much greater appreciation for the ordeals and difficulties these girls experienced at such a young age by being swept up in the music industry. While The Runaways film is definitely what got me to read this book, Neon Angel provides the backbone of The Runaways story and lets us get to know the real Cherie Currie. The movie, and particularly Kristen Stewart and Dakota Fanning did an amazing job of telling this story for the big screen, but Neon Angel really tells the story from start to finish. The story starts out well before The Runaways and finishes much farther down the road. Neon Angel lays out in words what we saw on-screen in The Runaways movie, but with personal detail that only Cherie could infuse her story with. I feel like the movie and the book really do go hand in hand because they complement one another so well with telling this story. The Runaways movie gives us the main events, the music, and highlights key moments for the band mates while bringing their story to life. Neon Angel fills in all of the little details, the befores, the afters, and all of the inbetweens. We see a darker side to Kim Fowley, we get to go to more of the parties and meet more of the people, and we go on much more lengthy tours with The Runaways band. At the other end of the spectrum, we get to know Cherie properly before any of the band formations start. She starts out as a 15-year-old in love with glam rock and Bowie, who’s trying to break free of her conventional mold. What I love most about this book is that we get to see the whole progression of Cherie’s life from 15 and innocent, to a rock star Runaway who has grown up at top speed in the fast lane. Neon Angel has some startling moments and some definitely made me uncomfortable. This book does not attempt to hide anything, it just shows and tells what happened to Cherie, Joan, Lita, Jackie and Sandy. The drug use, the parties, the abuse, the boys, the highs, the lows, and life on the road with the band are described in gritty detail. There are some very dark moments for Cherie, and experiences she had that are not examined in the movie. It’s raw and shocking, but I feel like it needs to be in her memoir, and I applaud her for her bravery and honesty in delving into those past events in order to share them with her audience. Above great story-telling, wit, honesty, and humour, Cherie should be celebrated for her candid recount of her life as a Runaway. This book also ties together Joan Jett and Cherie Currie in more detail. We see that Joan was Cherie’s constant rock during her time in the band. They lived, breathed, and made music together as an inseparable duo. Even Cherie admits difficulty in trying to define the nature of their relationship, that same sense of ambiguous connection that Kristen Stewart and Dakota Fanning portrayed so well in the movie. In Neon Angel, we get a further glimpse into the relationship between Joan and Cherie, and how important that was to both of them amidst the chaos and confusion of life in the band. I’d recommend this book to any music lovers, fans of The Runaways band, fans of Kristen Stewart and Dakota Fanning and The Runaways movie, and anyone else who loves a good memoir. Cherie’s storytelling is addictive and takes you on a whirlwind ride of 70’s rock and roll. Go pick up a copy of Neon Angel and you’ll see for yourself that this is a story worth sharing – you won’t regret it!